Most of the time, you’ll write Vue.js components that interact with a webpage via the DOM. But Vue’s reactivity system is useful for more than that. 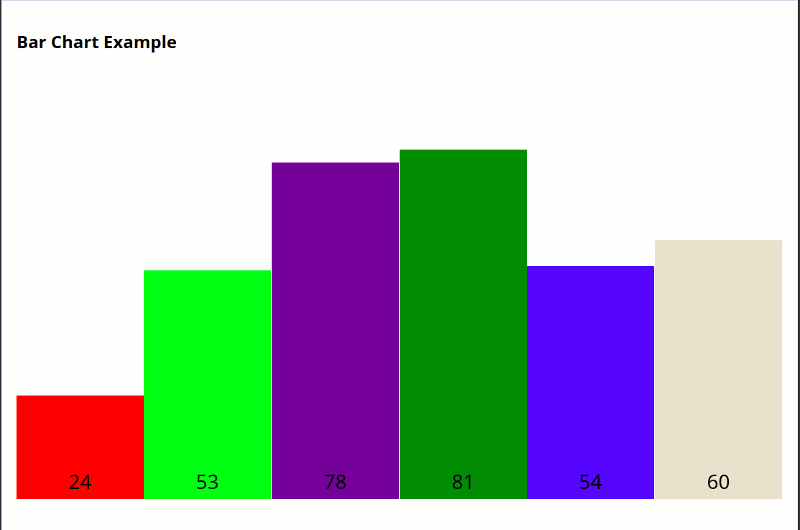 In this example, we’ll create a set of components to render a basic bar chart with Vue, in HTML5 canvas. :x1="((index / chartValues.length) * 100)"
:x2="((index / chartValues.length) * 100) + (100 / chartValues.length)"
// Randomly selects a value to randomly increment or decrement every 16 ms.
// Not really important, just demonstrates that reactivity still works. The canvas component itself is relatively simple. It simply creates a canvas element and injects the canvas rendering context into all of its child components via a reactive provider. // so child components will update when `context` changes. // This is the CanvasRenderingContext that children will draw to. // Allows any child component to `inject: ['provider']` and have access to it. // We can't access the rendering context until the canvas is mounted to the DOM. // Once we have it, provide it to all child components. // Resize the canvas to fit its parent's width. // Normally you'd use a more flexible resize system. MyBox.vue is where the magic happens. It’s an abstract component, not a “real” one, so it doesn’t actually render to the DOM. Instead, in the render function, we use normal canvas calls to draw on the injected canvas. As a result, each component still re-renders when their properties change without any extra work. // Note how there's no template or styles in this component. // Helper functions to convert a percentage of canvas area to pixels. // Gets us the provider property from the parent <my-canvas> component. // Start coordinates (percentage of canvas dimensions). // End coordinates (percentage of canvas dimensions). // The value to display. // The color of the box. // render so that we can clear the area later. // Turn start / end percentages into x, y, width, height in pixels. // Yes yes, side-effects. This lets us cache the box dimensions of the previous render. // before we re-calculate calculatedBox the next render. // injected by the time this render function runs the first time. // Keep a reference to the box used in the previous render call. // Clear the old area from the previous render. // Clear the area for the text. // Draw the new rectangle. This method could be used for any sort of canvas rendering, or even 3D content with WebGL and/or WebVR! Use your imagination! For now though, here’s a challenge. Try to add individual event handling by passing the dimensions of each box to the injected provider and have the parent canvas decide where to dispatch events.